Throughout the 5 days of workshop, it was heartening for both Arlene and for us at IPEVO to see that learning, playing and technology can indeed integrate seamlessly and successfully, as long as we have the right blend of all three elements. And so we called this success - “The Art of Blending”. 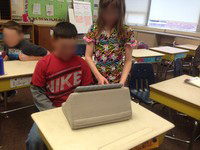 How teacher Beacco Elissa use PadPillow Pillow Stand for iPad - Light Khaki in the classroom. How teacher Griffin Angela use IS-01 Interactive Whiteboard System in the classroom. How teacher Handler Erika use Ziggi-HD Plus USB Document Camera in the classroom.